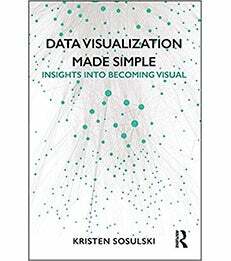 Data Visualization Made Simple by Professor Kristen Sosulski is a practical guide to the fundamentals, strategies and real-world cases for data visualization, an essential skill required in today’s information-rich world. With foundations rooted in statistics, psychology and computer science, data visualization offers practitioners in almost every field a coherent way to share findings from original research, big data, learning analytics and more. Both novices and seasoned designers in education, business and other areas can use this book’s effective, linear process to develop data visualization literacy and promote exploratory, inquiry-based approaches to visualization problems.